Trust ABC Electrical for appliance repairs. Providing electrical services in Brisbane since 1984.
contractor to be sent to your home. and book a dishwasher repair now. with a wide range of oven brands. professional electrician services in Brisbane. 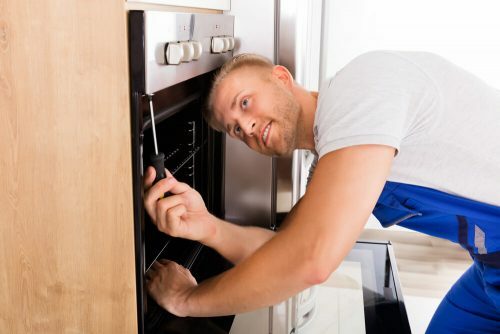 If you’re looking for appliance repairs in Brisbane, look no further than ABC Electrical! Our team of highly trained and fully licensed appliance technicians are committed to providing you with the best possible service in a time efficient manner. We aim to have your hard-working appliances up and running as quickly as possible. In business since 1984, ABC Electrical is the leading company in Brisbane for appliance repairs. We pride ourselves on being the business you can rely on for all of your appliance repairs. Our local Brisbane electricians also provide complete in-home electrical services for your convenience. DON’T WORRY, WE FIX THEM ALL. With over 32 years of industry experience, you can trust that if an ABC Electrician is on the job, it is being done right. Our electrical contractors have been servicing Brisbane for decades and are well experienced at handling a variety of electrical jobs. ABC Electrical contractors are renowned in Brisbane for providing a prompt, reliable and professional service. Our team is dedicated to exceeding your expectations and providing a friendly and professional service. We provide quotes before work is done so that you know exactly how much you will be spending. If we are unable to provide you with a fixed quote, we will outline the reasons why and give you an estimate. All ABC Electrical vehicles come stocked with a large range of common spare parts so that we are as best equipped as is practicable to repair your appliance on the first visit. If we do not have the spare parts required to repair your appliance on the first visit, and subsequently need to re-attend to fit parts, we will only charge you for the parts and the labour to fit those parts - we will not charge you a second service call fee. To attend to additional appliances during the same service call at the same premises we charge our quarter hourly rate of $33.00 or part thereof per additional appliance. * Please note that this does not apply for TV Repairs and electrical work. We accept cash, MasterCard, VISA, American Express (2% surcharge) or EFTPOS onsite. Payment is due and payable on the day of service to the technician. We do not accept bank transfer onsite and we do not provide credit under any circumstances. If you have any questions regarding our appliance repairs or would like to book for one of our electricians to visit your Brisbane residence, please contact us today! Our friendly team are at your service and are always available to answer any electrical related queries.